Stepping up efforts to help Nepal which was struck by severe earthquakes, The Indian Air Force is providing relief to the people in distress in Nepal. 5 tonnes of milk, light vehicles, RO Plant, Oxygen regenerators, Medicines, Blankets, tents, 14 tonnes of food (ITC Noodles). 03 National Disaster Relief Force (NDRF) teams, 02 Field Hospitals, 02 Air Force Communication Centre Vehicles and Medicine are being sent. Today, 04 C-17 Globemaster III, 03 C-130J Super Hercules, 03 IL-76 and 02 AN-32 aircraft were pressed into action from morning to night carrying relief material. Extensive helicopter operations have also commenced. A total of 87 casualties have been evacuated to a safer places and 3.5 tonnes of relief load have been air dropped in inaccessible places. A total of 2305 stranded persons have been evacuated from Kathmandu to India. 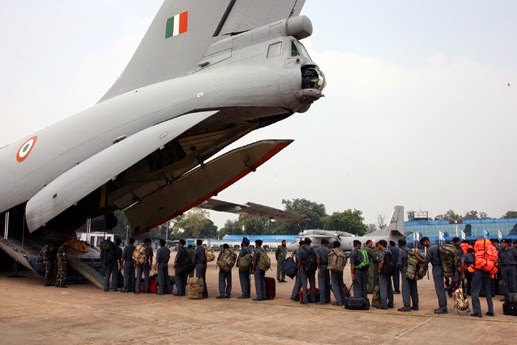 With weather improving in Nepal today, the Indian Air Force(IAF) along with Indian Army today fanned out to remote areas while continuing with transporting essential items from various bases to Kathmandu and evacuating distressed persons to India. As part of the ongoing rescue and relief operations of Indian Army(IA) as per priorities expressed by Nepal Army, a Task Force(TF) Headquarters has been established in Kathmandu under Maj Gen Sandhu of IA. Another TF has been set up at Barpak under Brig Gamlin of IA, today. Road from Kathmandu to Pokhara has been opened up by Engineer Task Force inducted yesterday. Satellite communication link between Nepalese Army Head Quarters and Indian Army Engineer Task Force has been established. In addition a Movement Control Team has been set up in Kathmandu to direct relief convoys to affected areas. (a) 4 x ALH & 2 x Cheetah helicopters are under induction to Pokhara where a Helicopter Base is being established. (b) Induction of 18 x Medical Teams (3x Field Hospitals) has been completed. One Field Hospital has been deployed at Rajdalgarh near Lalitpur with 01 x Orthopedic specialist 01 x Surgical Specialist and 01x Anesthetist along with attached medical staff. Additional doctors have been tasked to cover 80 Km radius area around the base in two Mobile Medical Teams. (c) One Engineer Task Force (ETF) inducted on 26 Apr 15 comprising 40 personnel. 5 x Earth Moving Equipment (Engineer Plant) and Generators also inducted. (d) 1400 Blankets and 40 Tents inducted on 26 Apr. 5000 blankets and 500 tents are planned to commence induction today, by road. (e) 10 x INMARSAT (Satellite Phones) inducted on 26 Apr 15. 5 x High Frequency communication detachments for direct communication has been inducted today. (f) Electrical Damage Assessment Team inducted today. Pension Paying Office at Pokhara is functioning as a Multi National Coordination Centre. Helicopters are being employed to evacuate people from inaccessible areas and adhoc helipads are being constructed at remote and inaccessible areas. 203 civilians have been evacuated to safe areas and 47 civilians evacuated to hospitals in joint effort with NDRF & IAF. Indian Army expedition team located at Everest Base Camp continues to assist in evacuation and rendering medical aid to the needy. In the wake of the recent earthquakesin Nepal and adjoining areas including India, the National Cadet Corps is planning to mobilise its cadets to actively organize mock drills in various schools to minimise damage in case of any earthquake. Since children in school are vulnerable to such disaster the National Cadet Corps has decided to spread awareness regarding the after care and management of such a disaster in case it happens. National Cadet Corps would educate all its cadets across its country about do’s and don’ts in case of an earthquake. It plans to carry out mock drills in schools and will also concentrate on first aid and casualty evacuation. The National Cadet Corps has a fourteen lakh strong cadet base across the country and education of all these cadets towards disaster management would go a long way in ensuring that minimum casualties occur in case such an earthquake happens in India. The indigenously designed and manufactured 155mm x 45mm calibre artillery gun, Dhanush has successfully met all technical parameters during the winter and summer trials. Informing the Members of Parliament of the Consultative Committee attached to his Ministry, the Defence Minister Shri Manohar Parrikar today said Dhanush incorporates many improved features than the guns which the Army is possessing at present. The Consultative Committee was discussing the Role Performance and Future of Ordnance Factory Board (OFB), one of the oldest and largest production organisation of the Ministry of Defence. OFB is a conglomerate of 39 ordnance factories with another two new projects being set up at Nalanda in Bihar and Korwa in Uttar Pradesh. Shri Parrikar said another notable achievement of OFB in the recent time has been the indigenous development of 40mm Multi Grenade Launcher (MGL) for 40 x 46mm Low Velocity Grenades (LVG). He also said the Assault Rifle ‘Ghaatak’ (7.62x39mm) Assault Rifle (AR) developed through in-house Research and Development has met all the parameters as per the General Staff Qualitative Requirements (GSQRs) during the trial evaluation by Para Military Forces under the Ministry of Home Affairs. The Defence Minister said the Ministry has taken a number of initiatives towards improving the performance of OFB. This includes efforts to operate OFB on a Corporate model (not Corporatise) with a commercial accounting system. The procurement manual has also been revised keeping in view the Make In India plan to facilitate long term procurement. Shri Parrikar said Quality Audit of eight factories will be undertaken by a globally reputed firm to improve upon the existing processes and attain Zero Defect production system. He said OFB is undergoing a paradigm shift from that of a manufacturer of defence equipment to a Complete Solution Provider. OFB’s new role will encompass design, development, bulk production and life cycle sustenance equipment. Shri Parrikar said OFB would be made into a lead integrator of major platforms and as a manufacturer of world class defence equipment. With the offset regime in place, OFB is also looking forward towards delivering many sub-systems to leading overseas players. During the discussion, Members of Parliament appreciated the contribution of OFB towards national security and for the transformation it has undertaken over the years. Some Members wanted that a manufacturing unit of OFB should be set up in the North – East. Members of Parliament who attended the meeting included Shri MallikarjunKharge, Shri PinakiMisra, Shri Anil Shirole, Prof.Saugata Roy, Dr.Mahendra Prasad, Shri Ashwani Kumar, Shri Pankaj Bora and Shri Shamsher Singh Manhas. The Minister of State for Defence Rao Inderjit Singh, the Defence Secretary Shri RKMathur, Secretary Defence Production Shri G Mohan Kumar, Secretary Defence Finance Ms. Vandana Srivastava and Secretary Ex-Servicemen Welfare Shri PrabhuDayalMeena also attended the meeting. The State Governments are taking measures at their own end for managing the disaster. None of the States has requested for any central help till now. As per information received Tihar Jail Authority are sending Biscuit (1,500 Kg) and Namkeen (500 Kg) to Nepal. At present food packets have reached at Palam Airport. (i) Relief measures by UP Government: Government of Uttar Pradesh sent 10 crates of drinking water, 10 crates of biscuits, 1 crate of medicines along with 1 medical team comprising of 22 doctors yesterday. The said relief materials and medical team reached Nepal this morning and have been handed over/kept at disposal of Nepal Authorities. 59 Buses from UP Government have reached Narainghat area (near Kathmandu). Due to landslide the buses are stranded there. As soon as the road is cleared, the same will move to Kathmandu. 41 Buses from UP Government are being sent today. Total 100 buses are to be deployed from the UP Government. (ii) Relief measures by Bihar Government: 10 buses from the Bihar Government have already reached Pokhra, Nepal and are engaged in evacuation. Another 05 buses are stranded on way to Pokhra, Nepal due to bad weather. As reported by DM, Control Room Bihar, so far 300 people have been evacuated. (iii) Relief measures by Uttarakhand Government: 25 Buses from Uttarakhand crossed over to Nepal at 1130hrs this morning for evacuating the stranded persons. Teams of other NDRF battalions have been kept on alert. NDRF rescued 180 persons in Darbhanga. NDRF Teams have rescued 10 persons live and retrieved 60 dead bodies. One UAV (Netra) is being sent to Nepal from 5th Bn NDRF. The said UAV has already reached Delhi from Pune & is likely to be dispatched for Nepal soon. Food & Supplies: So far, India has rushed 22 tons of food packets & dry rations, 50 ton of mineral water, 2 ton of medicines 40 tents & 1400 blankets. Rapid Arrow Medical Team (IAF) consisting of 03 Medical officers, 24 Medical Assistant along with 25 beds Hospital, Modules of OPD & Dispensary integrated with Medical equipments sent to Kathmandu. Forward Surgical Centres (Op Theaters) of Army Field Hospital (Tezpur & Sukna) comprising Ortho, Surg, Med Spl, Anaes & Med Offrs. FSC capable of operating 12 surgical cases/day. Oxygen cylinders (Forty 1246 litre, Forty 623 litre & Forty 200 litre) Four oxygen concentrators. Two doctors and 1 pharmacist are on the way to Nepal from Uttarakhand. INMARSAT established at Nepalese Army HQ (Kathmandu). Two more sets being established.